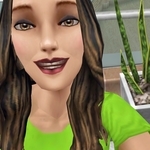 This is a 12 day live event that has the personal prizes from the Simtown Health Spa Community Event. We still have to progress through the personal prizes to unlock the different craft stations to use. So while you may have them in your inventory they are unusable until you unlock them again. You can tap on the magnifying glass to see what prizes are in each pack. 7 actions are stocked when you purchase a station from the home store. After those 7 are used it takes 2.5 hours to restock it for 9 uses or 10 SPs to restock for 18 uses. If you are using SP it is better to pay the 10 to get 18 uses as speeding up the 2.5 hour takes 9 SPs. Placing a station into your inventory will take away any stocked uses left in that station. If you want to move a station to another lot it is best to do it when it has 0 stocked uses left. Curious about the house template with this one - can the benches and patios in the center of the U-shaped house be altered or moved around? I notice the patio seems to extend across to the back section of the yard across the river with the rock garden, I was curious just how permanent the outdoor fixtures were or if it’s like the skateboarder house where there’s this big property-consuming thing that can’t be moved. They can't be moved. And the patio they are on can't be removed, either. The patio around them can be but not the patio they are directly on.